Horslyx Original Licks contain all the essential vitamins, minerals & trace elements, that your horse needs; as well as Biotin, Methionine & Zinc, for healthy hooves. They can be fed alongside forage or hard feed, to complete & balance the diet. Horslyx Original Licks also benefit from containing anti-oxidants & essential amino acids, to help keep your horse in optimum health. Horslyx Original Licks can entertain your horse & help relieve stress. As they are weatherproof, they are suitable to be fed out in the field, as well as in the stable. Horslyx Original Licks are suitable to be fed to all types of horses & ponies including those that are prone to laminitis (initially with restricted access, so they don't over-eat). 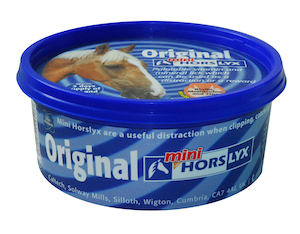 Mini (650g) Horslyx Original Lick is a handheld treat that can be useful in a number of situations, for example: - To distract your horse during stressful times, like farrier or vet visits, or clipping. - Encouraging a difficult loader - To help catch a tricky horse - To do stretching exercises 5kg Horslyx Original Lick is designed to be used with the Horselyx 5kg holder (sold separately), which is a wall mounting bracket & tub, that can be attached to your horse's stable wall/door or fence in the field. 15kg Horslyx Original Lick is designed to be used with the Horslyx 15kg Holder, which is an exceptionally strong tub, that can be used in the field or stable to feed Horslyx from the floor. Feeding Instructions- Large Horses (700kg), will consume on average of 300g per day, so 5kg should last approx. 17days. 15kg should last approx. 50days. Horses (500kg), will consume on average of 250g per day, so 5kg should last approx. 20days. 15kg should last approx. 60days. Ponies (300kg), will consume on average of 200g per day, so 5kg should last approx. 25days. 15kg should last approx. 75days. ) Horslyx is part of the BETA NOPS scheme.